Judicial or Non-Judicial Foreclosure- What is Arizona? 26 states employ a judicial foreclosure which is processed through the courts where the lender files a complaint and records a notice of Lis Pendens. This is more prevalent in the east and mid-west in states such as Florida, Illinois, Wisconsin, Delaware, and Pennsylvania. The homeowner may appear before the judge and dispute any material facts. The remaining states use a non-judicial foreclosure process. Arizona is such a state. This gives the lenders the ability to sell the property without court involvement. The process is much simpler and quicker. After missed payments the lender will issue a Notice of Trustee Sale, typically 90 days after the first missed payment. The Notice of Trustee Sale will set a sale date usually 90 days from the notice date. What was really said about the “tidal wave of foreclosures”? Activity in the 26 states with a judicial foreclosure process rose 24% in February, compared with February 2011, while activity in 24 states with a non-judicial process decreased 23%. Bottom line: The non-judicial states are processing the foreclosures quicker compared to their judicial counterparts. As the housing market bottoms out in many states, the blanket one size fits all comments about real estate can be very misleading. 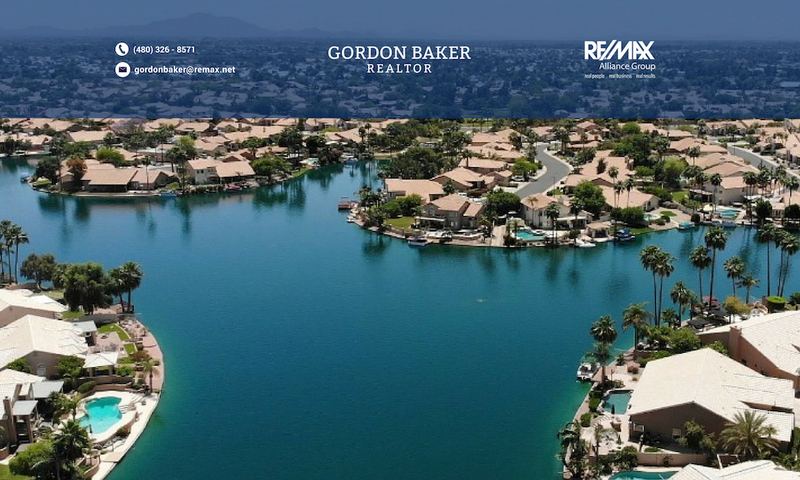 Just ask any buyer trying to purchase a house in the east valley who has submitted an offer only to find out that it went for above list price and there were 5 competing buyers. 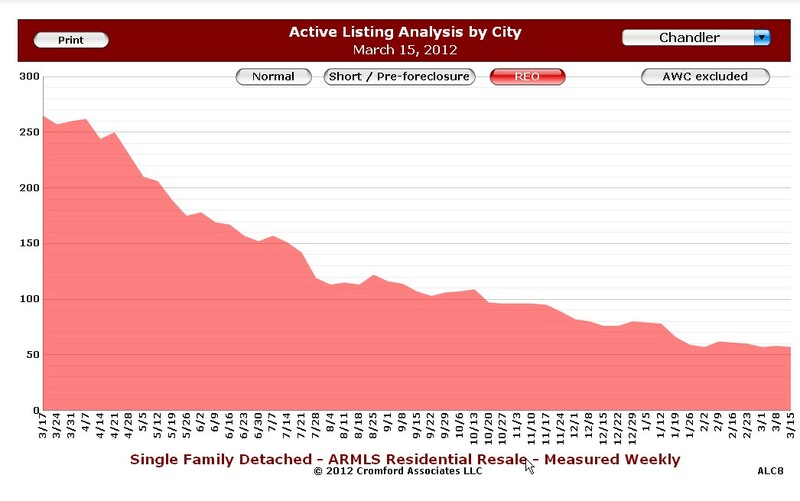 The graph to the left shows the active listings for Chandler foreclosures. It is clearly evident that the number of foreclosures is in significant decline as fewer homeowners are receiving a notice of trustee sale. Even if it levels out, I don’t see evidence of a tidal wave of foreclosures. If you are interested in receiving lender-owned foreclosures in any Phoenix area city, click on receive up to date foreclosure properties. Where’s the real estate market going in 2012? Who really loses on a foreclosure? SELLER MAY CARRY!!! Private Lender Financing Terms Available... Awesome Floor Plan... 5Bedroom + Den/Office Situated on more than 1/2 acre with N/E backyard, expansive covered patios. Soaring foyer, large entertaining kitchen with vast granite counters & island, abundant cabinets and storage, quaint breakfast nook plus formal dining, full guest suite w/private bath and entrance. Expansive master retreat that's literally a flat of it own, with large double shower, soaking tub, huuuuge walk-in closet, fireplace and private view deck overlooking spacious backyard and the McDowell Mountains. Huuuuuuge Beautiful Garden Beds and Fruit Trees Galore. What an AMAZING opportunity in Arcadia! This home was totally rebuilt in 2018 from the ground up. Now it needs the finishing touches. Open concept floorplan, soaring ceilings, gas fireplace, picturesque Arcadia street, and large backyard. This home features four huge bedrooms including a Mother-in-law suite/guest suite/office and expansive master with office/sitting room. Home still needs flooring, kitchen countertops, bathrooms, fixtures, pool finishes and landscaping. Such a great opportunity for investors/remodelers or buyers looking to put their own distinct touch on their home. Please note home is being sold AS-IS. Need lots of space? This home features 7 bedrooms, 4 baths, loft, basement,and large rooms. There is a bedroom and full bath on the main level, two bedrooms and full bath on basement level, and 4 bedrooms, 2 baths upstairs. The home has large main floor laundry room and bonus room which could serve as an office with French doors to the front. The spacious back yard is just waiting for your landscape plan. This property needs some TLC and you can let your imagination soar to see the potential. 4 bedroom/3 bath home in gated community of Las Sendas. Conveniently located near schools and Loop 202. Home features include brand new carpet, paint, granite and fixtures throughout. This beautiful home offers mountain views, North/South exposure, stone veneer, front porch, back patio with built-in BBQ, high ceiling with fans throughout, granite counters, wood shutters and a 3 car garage with cabinets and epoxy floor. This remarkable property is available for immediate sale. The seller is very responsive and the property is a perfect opportunity for all buyer types. Beautifully designed contemporary home on 4+ acres with stunning city and mountain views. The large living and dining areas are perfect for entertaining and family gatherings. Open floor plan featuring 5 bedrooms in the main house and 2 bedrooms en suite in the detached guest house with its own kitchen/family room/2 car garage. The backyard offers a full sport court, pool and putting green. This home is a Probate estate sale and subject to final approval by the court. The process has already been started and there is a foreclosure date in June so need to get this home sold! Original house had 1 bedroom and a large additional bedroom was added professionally. It also has a 1/4 bath additional too! Window AC was installed in larger room and does not convey..The other homes in the area have been selling for $100,000 so this is priced for quick sale. Current occupant is the trustee and is in the process of removing many extra belongings. Welcome Home! Move-in ready in a Golf Course Community. This home has been updated with new Quartz Countertops, new floor tile, new carpet & new Stainless Steel Appliances. This home features a very open & spacious kitchen with Kitchen Island, dining area just off the kitchen, French doors lead to the AZ/Bonus Room. Ceiling fans in all bedrooms, living room, AZ /Bonus room & dining area. There is a half bath just off the kitchen behind the custom barn door which leads to the laundry room. Master bedroom has his & hers closets, separate vanity, attached bath features a large walk-in shower. Home has a NEW ROOF, new blinds and paint thru out including new exterior paint. This home is located near shopping, restaurants, golf course. Hurry & call to see, this home will not last long!! GOLF COURSE LOT! This is a must see!! Open floor-plan, 3 bed - 2 baths, tile in all the right places, 2 car garage,laundry room and much more. Nice clean quiet neighborhood. Bring your buyer and their elbow grease, they will not be disappointed. Home does need a little TLC and will not last long!!!! Take a look at this wonderful house located on 2 acres. Large open home with incredible views from every room. Kitchen open to the family room with built in shelving and fireplace. Separate living room with wet bar and fireplace as well as a den. 3 split bedrooms. There is a huge master bedroom with fireplace and walk out to the expansive back yard, huge walk in closet with natural light, two vanities, separate shower and Jacuzzi tub. Both additional bedrooms have ensuite baths. The perfect 4 car garage with lots of storage and work space. Previous PostPrevious Where’s the Phoenix real estate market going in 2012?